dropahead Curation Report - Best posts from 2018-11-12steemCreated with Sketch. Help us to grow this project! Support the dropahead Curation Team! The @dropahead Curation Team makes a daily selection of the best posts, prioritizing those undervalued. Every selected post is peer reviewed and provided with an score so that the author can track progress; then, selected posts are promoted, upvoted and resteemed to maximize earnings and visibility of authors. We are making a huge effort every day to support our community of fellow steemians! Be part of the movement! It is 100% free and it takes only 15 seconds or less, you have NO excuses! Upvote & Resteem this post! 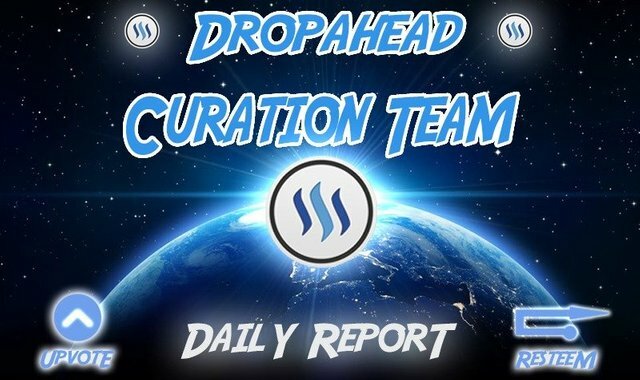 Upvote & Resteem the latest dropahead Curation Reports! Special thanks to all our sponsors and supporters!